Complete claw assembly that is included with the NuPulse Mini Milker. Includes set of inflations, shells, short air tubes, claw, hose and squeeze clamp. If you would just like the Original Standard Claw only, click here. 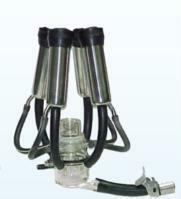 Complete claw assembly that is included with the NuPulse Mini Milker. The pulsator is built into the claw. Comes standard with 5/8" hose. Includes set of inflations, shells, short air tubes, claw, hose and squeeze clamp. If you would like to purchase just the Original Standard Claw only, click here.